Happy Friday everyone! 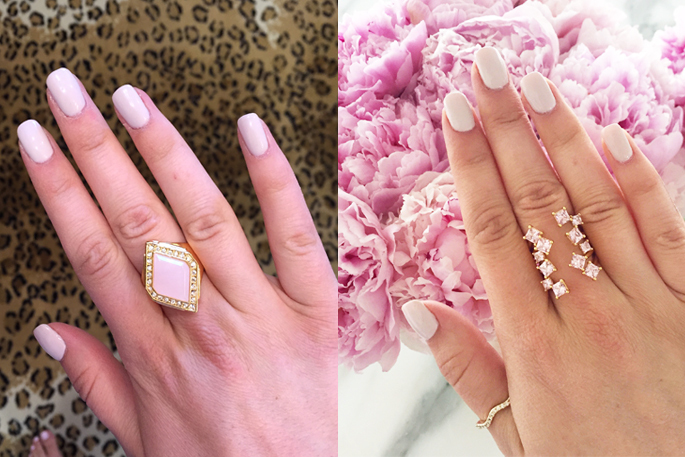 Today I’m so excited to share that two new ring styles have been added to my jewelry line, Pink Peonies Collection! Be sure to check them out here & here!! Below are a few pics of them! Beautiful spring look. Love your dress and your cute heels! That dress is gorgeous and i love it paired with the denim jacket! Gorgeous rings, you’re such a good jewelry designer! Love your dress too, lovely print! So lovely and stylish! Amazing rings! Beautiful dress! The new rings are so pretty. Been seeing this dress everywhere and I love it! that dress is lovely! the new rings are gorg! So stunning…and loving the background blossoms! Gorgeous spring dress. Love the print. I’ve been seeing this dress everywhere lately but you look great in it! It looks so cute with you baby bump! This dress is beautiful and paired perfect with the heels! What a stunning look! 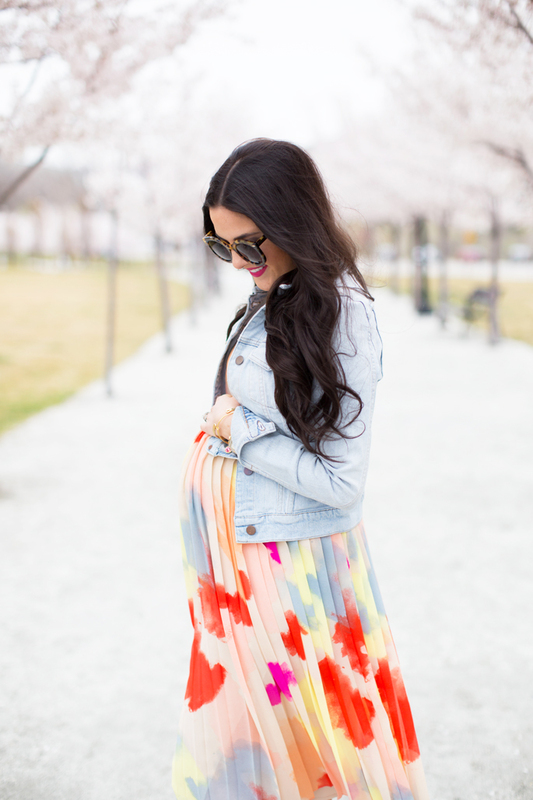 That dress is gorgeous, and I love how you styled it with our jean jacket! Gorgeous rings.. and love the colourful bump styling! LOVE this dress! It looks great with the light wash jean jacket. Congrats on the new ring styles. GORGEOUS!! LOVE THE DRESS AND HEELS!! YOU LOOK LOVELY!! So feminine and adorable! Your dress is so cute, perfect for spring, love all these colours! Love the shoes, the colour is incredible! I like this dress better on a pregnant person than a non-pregnant person. It’s so flattering and your outfit is gorgeous! I’ve been seeing this dress everywhere and I love it! You look so pretty!! Oh this dress is absolutely magical! Love how it flows with the wind. And the entire color palette is so gentle and filled with Spring spirit! Ooh, loving this beautiful dress! Your shoes really look amazing with it. Have a great day! That dress with those shoes is beautiful ! Love the rings you are wearing as well! I have seen this dress a few times now and I am seriously wanting to purchase it! Ugh! Decision! You look stunning! Love that dress! The pleats are great and the new pieces are fun too! Lusting after those spring trees – come on NYC, get with it! Darling look!! I love this dress! Love the floral print dress and the pop of pink! i am so excited for spring! i’m ready for the return of pastels and light colors!!!! Rachel, you look SO beautiful! I love how you have been able to find non maternity pieces throughout your entire pregnancy. Love this dress on you! The dress is so pretty and the background is beautiful! Stunning look!! Love it so much! How did you decide sizing with the baby bump? Did you order up a size? 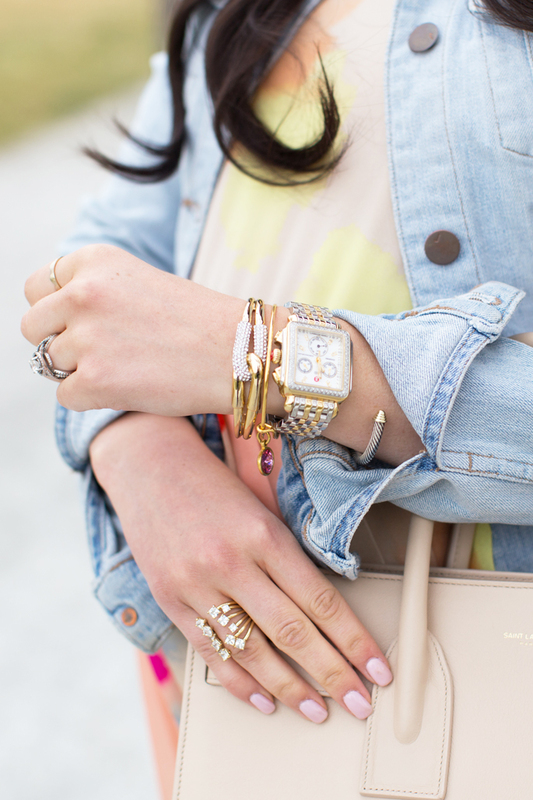 So obsessed with that light denim jacket! It’s just so much more chic than my Levi’s classic trucker wash.
Beautiful dress and outfit! Also that crystal cluster ring is BEAUTIFUL! oh, wow! You look like a beautiful watercolor painting in this dress! Such a beautiful dress! Your photos are amazing! Wow! I love the blushing chrystal ring. And your outfit is amazing too. I’ve been seeing that dress everywhere lately and I just love it! Beautiful rings and dress! Love your Jewelry collection! Pretty look! I love the new pieces you’ve added to the collection! You look great in that dress! LOVE IT! You look beautiful. I love your dress. Love the soft, flowy dress with the tougher denim jacket. And I’m impressed that you can still wear your stilettos this far along in pregnant – at 7 months I could only do flat sandals until my baby arrived. Love your jewelry collection. These rings are so beautiful. In love with this look! And those shoes are FABULOUS! A cool summery look and loving your heels! I love the new pieces you’ve added to your jewelry collection! The color is perfect for spring! I love this colorful look! Beautiful new rings, too! Love this watercolor print on you! What a gorgeous dress. I follow you on Instagram and love your blog. However no matter how many times I try to subscribe to your blog, I can never get it to work! Please help. Another beautiful Spring look. I love the colors of the pleated dress, and the pink pumps are perfect! Your two new pieces are amazing. Keep them coming! Love the color splash prints of the dress, they are so vibrant and pretty! Gorgeous rings too! I love this dress, the colors are so cute, perfect for Sping! This is by far one of our favorite outfits in a while! I really am in love with this bag… and your heels are so nice as well ! What a lovely dress ! Love your feminine style!! What a beautiful post! I love the scenery and how the colors just pop off your dress! And congrats on your two new rings in your jewelry collection. I especially love the pink triangle ring. I will have to pin it for later!